My penultimate piece of coverage of the Sony PlayStation Beta Rooms will recall my hands-on experience with Little Big Planet 2, Gran Turismo 5 and 3D gaming. Get some! Just the one level on show, although I caught a fleeting glance of an arena level while the demo guy set up a game for me. What I actually played was a platforming level, a multiplayer point-race game familiar to fans of the original. Sackboy still has a stumpy, floaty jump which is a bit disappointing as it was quite poor in the original, I hope the transitions between background and foreground can be smoothed out a bit more too. The new grapple was on show though, which will probably go on to become an essential tool for co-op players, and a mischievous sod’s device of choice. The grappling hook can be used to grab onto certain surfaces (like sponge) and then pull yourself up, drop down or swing from side-to-side to get momentum for jumps. If you’re lagging behind in a race you can even grab onto another player with it. So if they’re making a jump over a fiery pit, just lasso them mid-jump, dropping them into their smouldering grave. Or grab a lift with them when they’re swinging around. Yes it’s very funny and we all had a laugh doing it, but by the end of the race it started to get old and we all kind of stopped doing it to save any potential outbursts of “Ok, don’t take the piss!” to ruin the amiable atmosphere. If it ends up becoming a problem online, maybe it would be an idea to limit the amount of times it can be used per race. Looking good so far, if not a bit familiar, but I’m sure the huge variety of new game modes (shooters, kart racing, arenas, rhythm-action etc.) 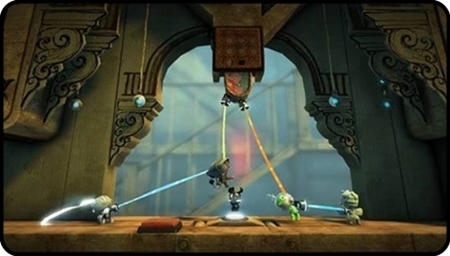 in the final version will have us falling for Sackboy all over again. Considering the years put into the game it’s no surprise that’s it’s gorgeous to look at, ‘better than real life’ would be apt as no tracks or cars are this clean and polished. Poor old MotorStorm comes across as a bit of a skank after looking at this classy lady. But before you get your hands on it beware, GT’s long absence has been filled with competitors like Grid, Dirt 2 and even Need for Speed Shift, the first two being leaders in their disciplines. It would seem I’ve picked up plenty of bad driving habits since last playing GT as it takes a while to adjust to the handling again. There are lots of varied simulation settings available and it will take time to find a good starting point that you can start (again) from. Well, unless you’ve just been playing GT4 and Prologue all these years, shunning temptation from elsewhere. God knows what twisted setting it had been left on, but the rally track I tried out was a bit of a nightmare as I struggled to stop the car fish-tailing all over the place. As a huge fan of rally games I felt a bit bewildered with it to be honest, but I’m fairly confident that a bit of personal sim-reclimatisation and preferred setting tweaking would get me back on track (literally hopefully). The other track I tried was a street track set in Rome against some AI cars. The walled-in track allowed me to be a little braver on the corners than the open rally track and the return of the racing line allows lap-by-lap improvement. The AI seemed to be more aggressive than past games which is something we’ve been waiting for for a while. I didn’t see any car damage on show yet, but at the same time I didn’t really want to be seen barrel-rolling in public. Personally, I’m still loving HD and have felt 3D cinema to be way behind my expectations, but I was open to a change of heart for 3D gaming. There were a few titles on show with separate 3D displays; I’ll talk about Killzone 3 in my separate preview (coming soon). Here’s my rundown of the rest though. Gran Turismo 5: The first 3D that’s immediately noticeable is the heads-up-display that seems to hover off the screen. Don’t expect anything else to come flying out of the screen at you though. The added depth only really becomes noticeable when you switch to the in-car view as it adds a sense of immersion as you look down your bonnet and admire the extra work that’s gone into replicating car interiors. If you play with the camera behind the car though, you’re just not going to notice as much 3D as you’d want for forking out £2000 on a new TV. MotorStorm: Apocalypse: Easily the best looking 3D title of the event. Chunks of debris and boxes thunder towards you as you tear your way through the streets. The increased depth looks good, but doesn’t help (or hinder) your racing at all in regards to judging corners. The highlight of the races was when I emerged from a tunnel, several cars flew past overhead from an alternate route and it really gave the impression that they were flying over my shoulder. Great, I have to get overtaken to be really impressed. Because 3D needs to make twice as many images, there was a noticeable drop in resolution, especially with the debris coming towards you. The 3D glasses naturally meant that everything was a touch darker too, which made the already too dark underground sections even more of a pain to navigate. This game is still at pre-alpha stage though so the 3D could be in for a truck-load of polish yet along with the main game. 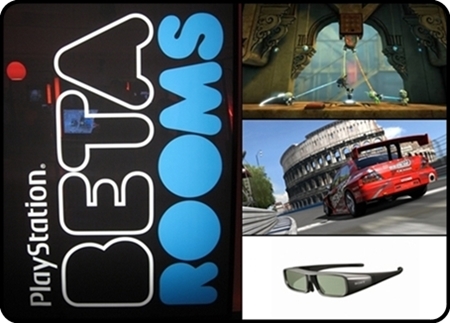 Missed the earlier coverage of Beta Rooms? Check out these links for PS Move Part 1, PS Move Part 2, and Games Round-up Part 1.